We’ve all experienced unforeseen financial circumstances when we need a sum of money quickly to pay off some pressing debts and bills, afford necessities, or deal with unexpected emergencies. CashCity strives to make it as simple and convenient as possible for you to secure the sum of cash that you need to get over this temporary hump. Along with some of the most competitive rates in the industry, you’ll be happy to hear that our service is fast and hassle-free, with no credit checks or long approval processes. In fact, you can get pre-approved online now, and simply come in to our centrally-located shop in Etobicoke to pick up your cash. We are open for extended operating hours to serve your needs even better. Secure your payday loan of up to 75% of your regular paycheck today. 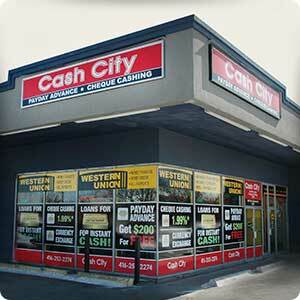 Why get a payday loan from Cash City? What is the maximum sum of money I can get for my payday loan? The maximum allowed payday loan amount in Ontario is $1500. You can be approved for a maximum of 50% of your income. What forms of documentation do I need to get a payday loan? What is the advantage of getting a payday loan with Cash City? When it comes to getting a payday loan with Cash City, you can rest assured knowing the entire process will be carried out quickly, professionally, and conveniently. We do not perform credit checks, or report to credit agencies. Our central Etobicoke location is easy to reach, and we are open extended hours throughout the week to make it even more convenient for you. You’ll love our friendly and courteous service, our competitive and cost-effective rates, and the simplicity of the whole process. Come into our Etobicoke shop today to secure your payday loan. To get your payday loan, come into our convenient Etobicoke location, and bring with you two pieces ID (one of which is a government-issued photo ID, and another that shows your signature). Along with this, we require a 60-day bank statement, two of your most recent pay stubs, a utility bill to confirm address, and a personal cheque or pre-authorized debit form. Based on your salary, you will be approved for a payday loan anywhere from 30%, all the way up to 50% of your paycheck, at some of the most competitive rates in the industry. Your $500 loan for 14 days. The loan term can be up to 31 days.